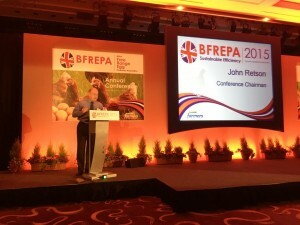 John Retson will be chairing the conference for the fourth year running, and quoting the “Conference & AGM ” programme “John is a stickler for time keeping” – I’m sure everything will run smoothly and a great day will be had by all. Guest speakers are Adam Henson from Countryfile and Allan Wilkinson of HSBC Bank also James Baxter this years Farmers weekly “Poultry Farmer of the Year” winner. The BFREPA Free Range Awards sponsored by Elanco, will be announce by none other than Alan Dedicoat the voice of the National Lottery and Strictly Come Dancing, along side Adam Henson presenting the awards to the winners, good luck and congratulations to everyone entered for an award.